Since the beginning, Google’s mission has been to organise the world’s information. That mission is just as relevant today – and in Australia – as it was back then. From building our coverage of Australia on Google Maps, to charting the Great Barrier Reef through underwater Street View and surfacing high-quality health information in Google Search, we’re carrying out that mission in Australia in many ways. We know that sport sparks the Aussie spirit like nothing else, and getting information about the sports and teams you love is important to keep you cheering, and across the action. And with the AFL, NRL and Australian Rugby seasons here, it’s the perfect time to gear up for the games that captivate our nation. 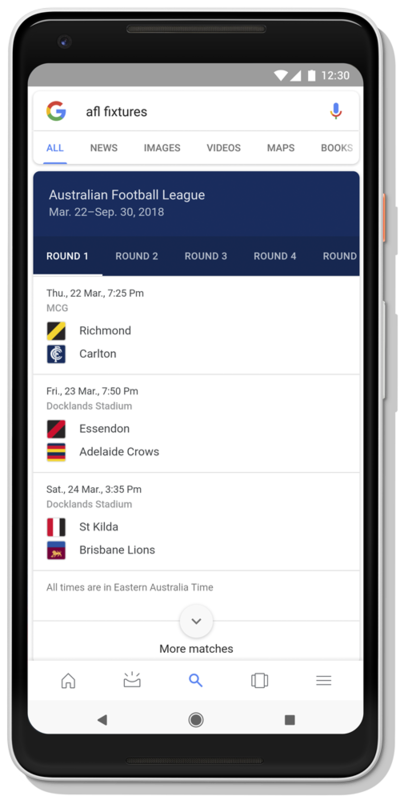 If you’re stuck in meetings or at the farmer’s market with the in-laws, you can stay in the game with up-to-the-minute scores for your team across AFL, NRL or Australian Rugby. Live scores will be available in a snapshot at the top of Google Search Results, so you can sneak a quick glance when you’re on the edge of your seat. 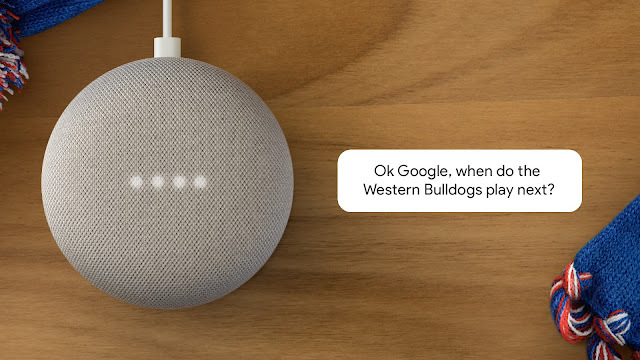 With a simple voice command, you can also ask your Google Assistant to check the ladder to see if your team is safe. Looking for a download on on the latest sports stories? Stay up to date with news bulletins from ABC Sport, Fox Rugby and AFL News, thanks to Telstra. You can follow the news of all 18 AFL clubs by asking “Hey Google, play the Sydney Swans news” or “Play the West Coast Eagles news.” The AFL news briefings are updated once a day during the off-season, and twice a day in the regular season. Your Assistant is always learning, so it will understand your preferred team nicknames and the sports you care about over time. 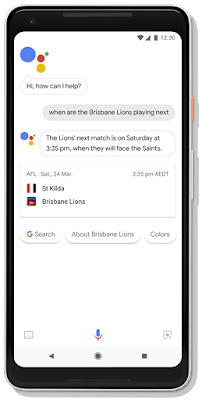 You can also ask your Assistant to tell you an AFL joke, or make season predictions by asking “Ok Google, who’s going to win the flag?.” And after the siren sounds on full time, say “Talk like a footballer” to get that classic post-match commentary full of the footy cliches we all know and secretly love. Whether you are celebrating a win or lamenting a loss, we hope these updates offer some useful and fun ways help you keep up to date and get your game on!